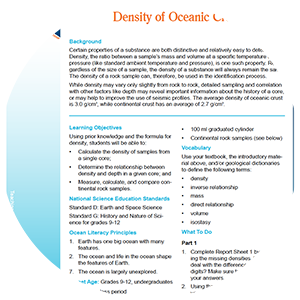 Actvity Summary: Students will be able to calculate the density of samples from a single core, determine the relationship between density and depth in a given core, and measure, calculate, and compare continental rock samples. Certain properties of a substance are both distinctive and relatively easy to determine. Density, the ratio between a sample’s mass and volume at a specific temperature and pressure (like standard ambient temperature and pressure), is one such property. Regardless of the size of a sample, the density of a substance will always remain the same. The density of a rock sample can, therefore, be used in the identification process.